Merion Golf Club is located at 450 Ardmore Avenue in Ardmore, Pennsylvania. 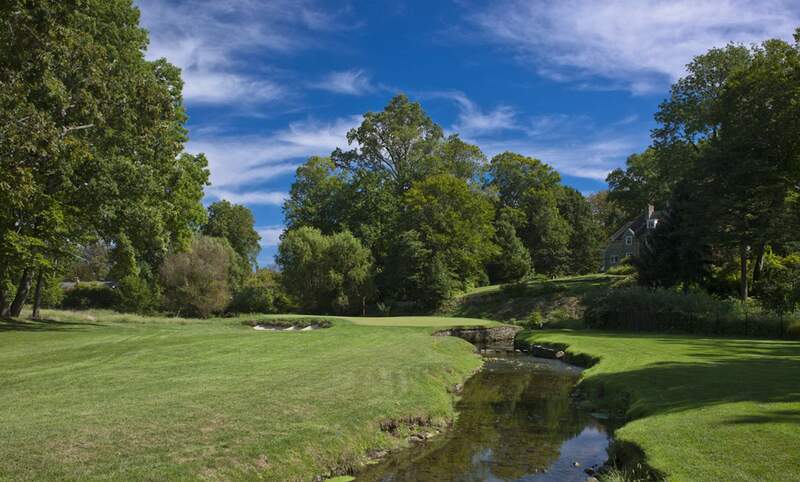 Merion's West Course is located at 300 Ellis Road, Haverford, Pennsylvania. To reach the Club, follow these directions or use Google Maps. From New York, New Jersey, etc. Take the Pennsylvania Turnpike (Rt. 276) West to Exit 20 Mid-County (Route 476 – heading to Chester). Proceed South on 476 about 6+ miles to Exit 13 (Rt. 30 – Villanova, St. Davids). Turn right (East) on Rt. 30 to Ardmore Avenue (about 3.5 miles). Turn right onto Ardmore Avenue and proceed about 1.1 miles to the Club entrance on the right, just after the small bridge the railroad tracks. (Green signage – no name, only number 450). To reach the West Course continue on Ardmore Avenue for about 1.25 miles until you come to a severe left curve. Proceed around the curve, and then make an immediate right onto Ellis Avenue. The Bungalow and West Course parking lot will be immediately on your right after turning onto Ellis Avenue. From Wilmington (DE), Baltimore, etc. (A) North on I-95 to Route 476. North on 476 (heading toward Plymouth Meeting) to Exit 13 (Rt. 30 – Villanova, St. Davids). Turn right (East) on Route 30. Proceed about 3.5 miles to Ardmore Avenue. Turn right on Ardmore Avenue and go about 1.1 miles to the Club entrance on the right, just after the small bridge over the railroad tracks. (Green signage – no name, only number 450). (B) North on I-95 to Route 476. North on 476 (heading toward Plymouth Meeting) to Exit 9 (1st sign reads Newtown Square/Havertown & 2nd sign reads Broomall/Upper Darby )(Route 3). Turn right on Rt. 3 and get in the left lane. At the second light, turn left on to Lawrence Road and get in the right lane. Turn left at the second road (Ellis Road). Stay on Ellis Road until you come to a “T” (log cabin). This is the West Course. To proceed to the East Course/Clubhouse then turn left on to Ardmore Avenue. Proceed about 1¼ miles to the Club entrance on the left. NOTE: “A” is easier to follow, but “B” is about 5 miles and 10 minutes shorter. Take I-95 South to Route 476 North. Bear right on Route 476 North (exit 7), heading towards Plymouth Meeting. Then follow directions (A) or (B) above. Take Route 76 (Schuylkill Expressway) to City Line Avenue (Route 1). Turn left (South) on City Line Avenue and proceed about 3.3 miles to Haverford Road. Turn right on Haverford Road and go about 2.7 miles to Ardmore Avenue. Turn left on Ardmore Avenue. The Club entrance will be on your right (about 200 yards) just after the small bridge over the railroad tracks. To reach the West Course, continue on Ardmore Avenue for about 1.25 miles until you come to a severe left curve. Proceed around the curve, and then make an immediate right onto Ellis Avenue. The Bungalow and West Course parking lot will be immediately on your right after turning onto Ellis Avenue. Take the Pennsylvania Turnpike (Rt. 76) East toward Philadelphia. Proceed South on 476 via Exit 331A. Continue on 476 for just over 1.5 miles to Exit 13 (Rt. 30 – Villanova, St. Davids). Turn right (East) on Rt. 30 to Ardmore Avenue (about 3.5 miles). Turn right onto Ardmore Avenue and proceed about 1.1 miles to the Club entrance on the right, just after the small bridge over the railroad tracks. Take the Atlantic City Expressway West to NJ-42 North. Continue on NJ-42 N as it becomes 76 West. Merge onto I-676 N toward I-676 N / CAMDEN / B FRANKLIN BR (portions toll – crossing into Pennsylvania). Continue onto Route 76 West (Schuylkill Expressway) to City Line Avenue (Route 1). Turn left (South) on City Line Avenue and proceed about 3.3 miles to Haverford Road. Turn right on Haverford Road and go about 2.7 miles to Ardmore Avenue. Turn left on Ardmore Avenue. The Club entrance will be on your right (about 200 yards) just after the small bridge over the railroad tracks.